ISLAMABAD, Pakistan (CNN) -- Dozens of containers, possibly holding supplies for NATO troops in Afghanistan, burned after militants attacked a Pakistani freight terminal with mortars and grenades early Sunday, according to Pakistani police officials. A security guard in Peshawar guards trucks loaded with supplies for NATO forces in Afghanistan last month. A security guard was killed and two employees were wounded in the attack on the Faisalal terminal just outside of the city of Peshawar, according to officials. Companies hired by NATO to drive fuel, food and other supplies to troops fighting the Taliban use the terminal to park containers waiting for convoys across the border into Afghanistan. The fire started by the attackers destroyed 62 containers, according to Peshawar Senior Police Superintendent Kashif Alam. Some of the dozens of attackers were captured, Alam said. He criticized the contractors for not providing enough security for the terminal. 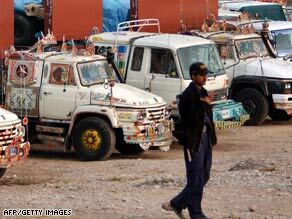 Militants attacked another Peshawar terminal a week ago, destroying several trucks. Trucks moving from Pakistan to Afghanistan have been attacked in recent months, including one incident in which dozens of trucks with fuel for NATO forces were burned while parked in the Khyber agency of tribal region last March. Last week, militants fired rockets at a supply terminal in Peshawar that sat along a route from Pakistan to Afghanistan. The attack left two people dead, two others wounded and 12 trucks ablaze, Peshawar police said. Pakistan's central government has long exerted little control in the area, but it launched an intense military offensive in late July to flush out militants. As retaliation for the military presence, the Taliban has carried out a series of deadly bombings -- and said the attacks will continue until the troops pull out. Convoys carrying food and military supplies to U.S. troops in Afghanistan have regularly come under attack. CNN's Reza Sayah and Samson Desta contributed to this report.